Looking across the wide terrace, you can see the many distinct groupings and seating areas Mr. Dixon Designed. 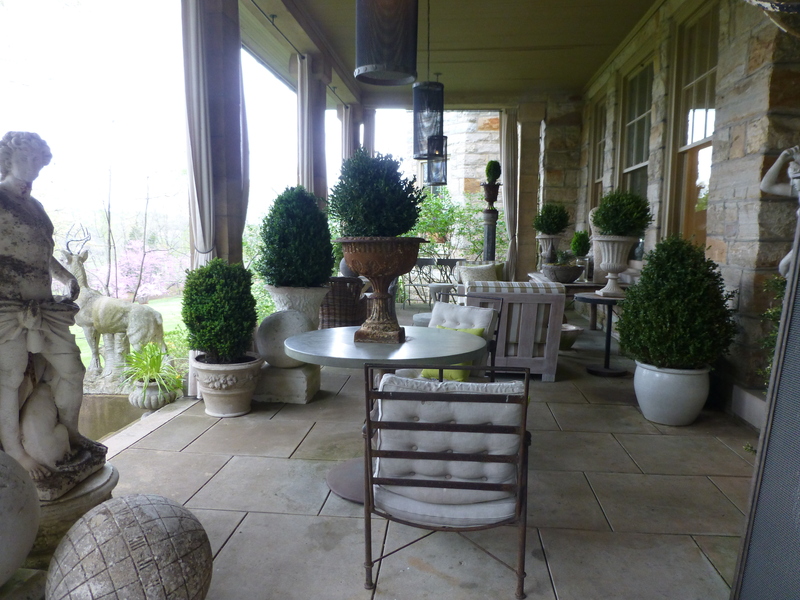 All the furnishings were kept neutral and stone-colored, and plantings are mostly boxwood in large stone planters. Today I want to share some photos of the back porch at Elway Hall. Mr. Dixon furnished it with the most amazing outdoor furniture and sculpture. It’s just magical! There is a lovely wide stone porch across the back of Elway Hall, which Barry Dixon has filled with a stunning array of stone statues and objet d’art. 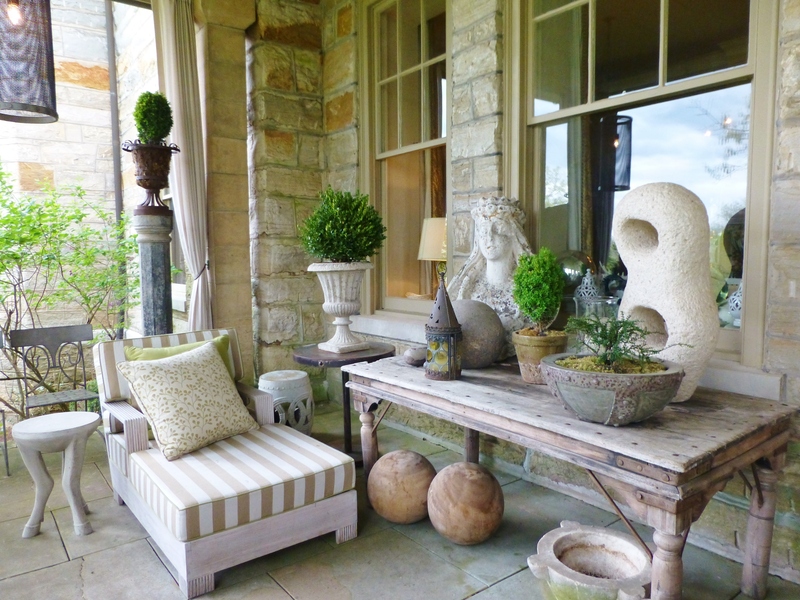 Barry Dixon’s back porch contains an amazing variety of garden statuary, accessories and many examples of his own furniture line (I believe the three legged stool at the left is part of Barry Dixon’s line for Arteriors). It must be so wonderful to lounge out here, taking in the view of the grounds at Elway Hall in the summertime! 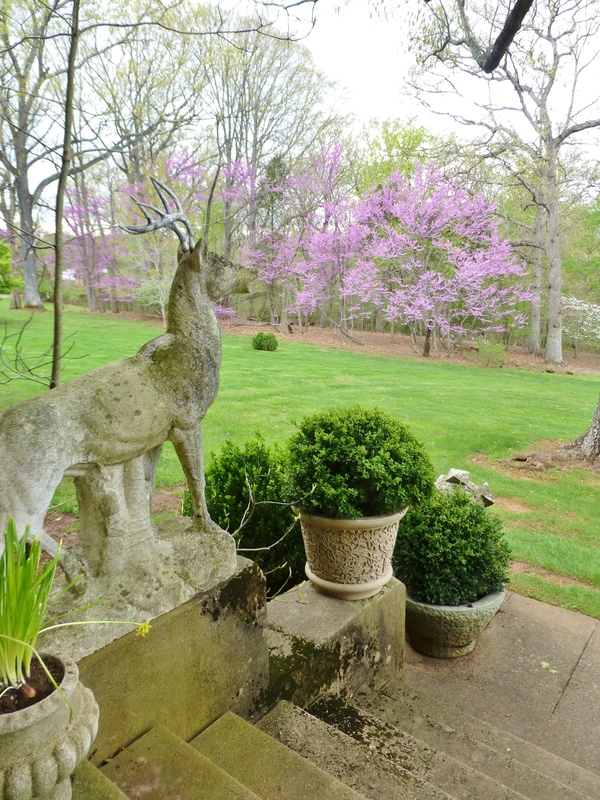 A pair of large stone stag sculptures flank the stairs and look out across the lawn. Here’s a view of the opposite side of the stairs leading up to the terrace. Grady especially liked the orb statue in the foreground. 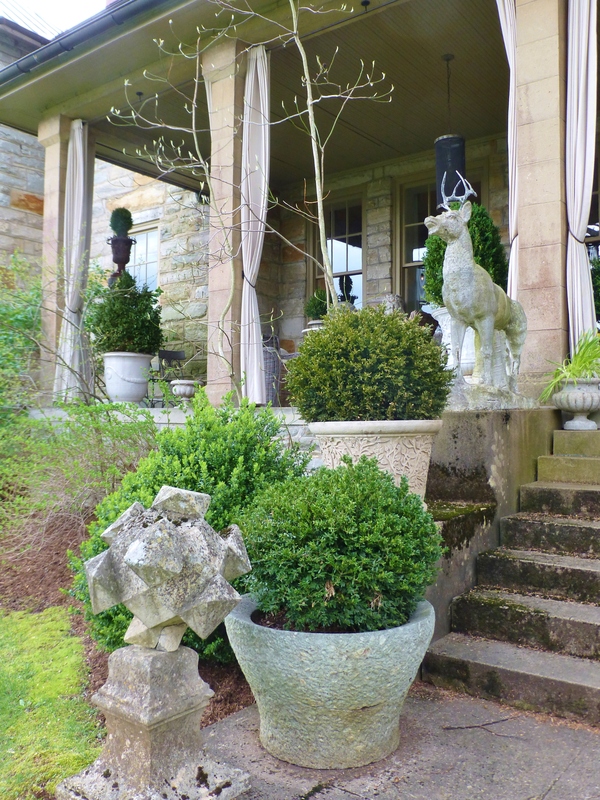 I love the simplicity of the boxwood shrubbery in those big stone pots. They allow the garden sculptures to be the stars! Here are the entry doors leading inside the home. 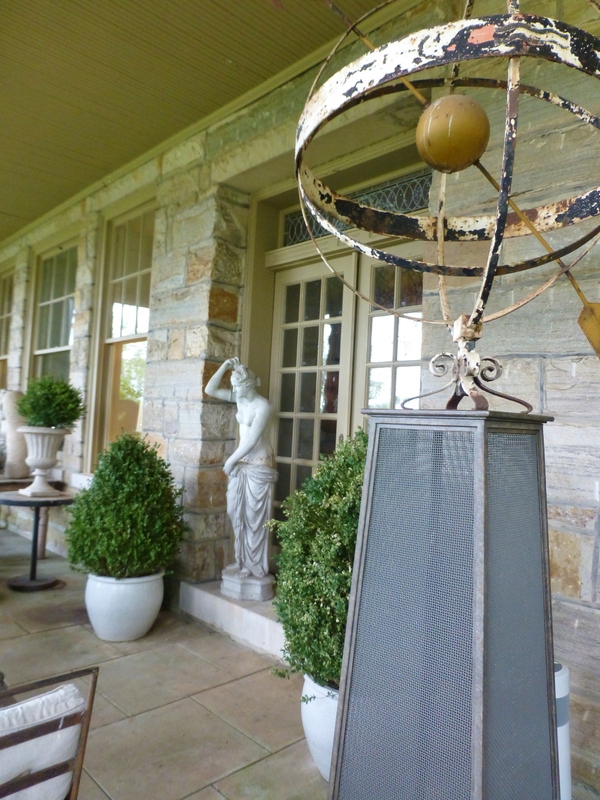 A Grecian statue is perfect in the doorway, and a mesh pedestal elevates a rustic garden armillary sphere. The metal mesh pedestal is one of Barry’s own designs! My final image is from a little side porch off the front of Elway Hall. 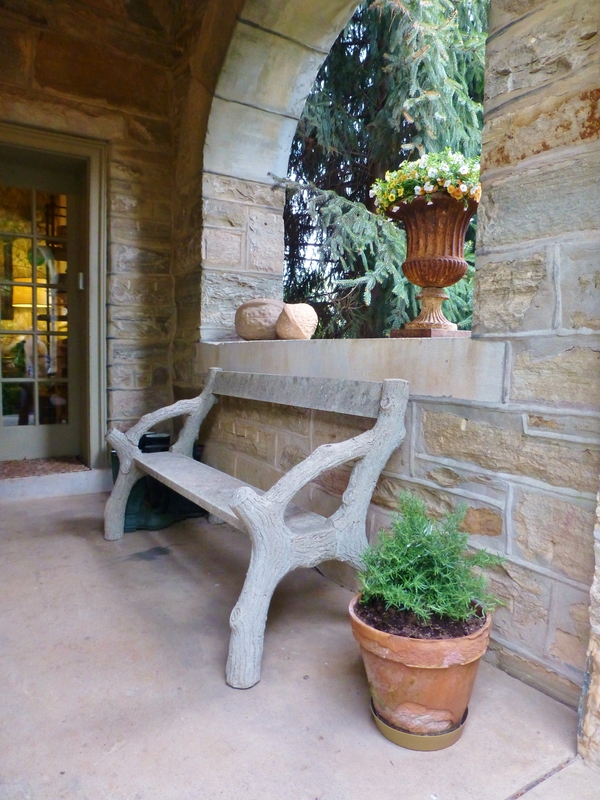 I thought the stone faux bois bench was so charming centered under the archway. And the giant nut sculptures sitting up on the ledge are fantastic too! 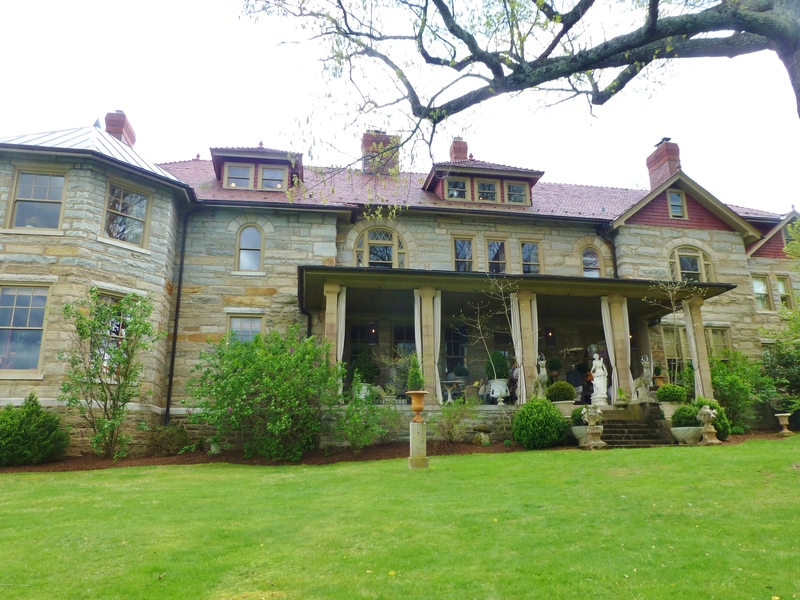 Well, I hope you enjoyed my little visit to Elway Hall, the home of furniture and interior designer Barry Darr Dixon. It was such a pleasure to see this amazing home in person! I’ll be sure to post more inspirational photos of my travels soon, until then feel free to share my posts and images on Pinterest and social media. I love making new friends! This entry was posted in Barry Darr Dixon, Elway Hall, Garden, Home Decor, Mansion and tagged Armillary Sphere, Boxwood, Interior Decorating, Outdoor Furniture, porch, Stag Sculpture, Statues, Stone Mansion, Stone Sculptures, Terrace. Bookmark the permalink. It’s been interesting to see the metamorphosis of Elway Hall, as I *seriously* contemplated purchasing it prior to Barry Dixon. I ended up building my own stone home, pics: http://www.ADetailedHouse.com (a blog I used to write), but I’m so glad he ended up as the buyer. Although when I looked (and looked and looked) at it, it had been renovated, it needed to be done well. (Unfortunately, that person also took the grand mantel mirror that was original to the house and sold it – ugh! It should have stayed with the house!) The person who renovated it did so on the cheap (kitchen, bathrooms, etc) after it had stood abandoned for years, but Barry Dixon came in and tore all that out and brought it up to its original grandeur, like no one else could have. He has made Elway Hall an enviable lifestyle.